Yesterday I went to Texas World Speedway, in College Station, TX for The Drivers Edge. I got a ton of photos which I'll post on here soon, but I felt a little nostalgic and today I looked back to images I took at TWS in the past. I went in 2003 and 2004 as a spectator to a few events while I was in college. 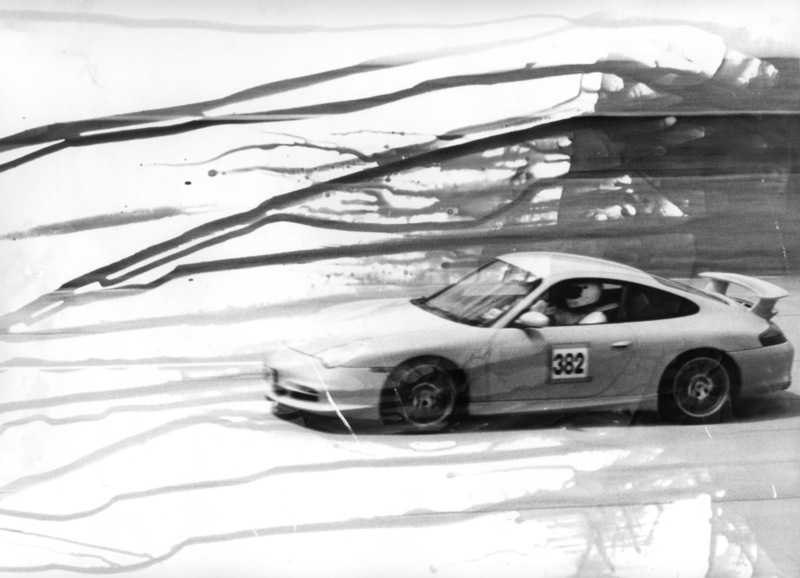 In September 2004 I went to a Porsche club event and brought my Nikon FM10 that I was using for my B&W Photography class. I don't remember what happened with any of the other negatives, but I did develop this image for my class and I decided to get very experimental with the processing. If I remember correctly, I was using the 35-70mm lens and I just enlarged it a ton when I exposed the negative. Instead of submerging the exposed photo paper in the developer, I stuck half of it in the developer and let it run down the other side, leaving it undeveloped everywhere that stayed dry. Initially I regretted the way the drips run (I wished they ran the other direction, as if trailing off the car) but now I definitely think this way is better and prefer the balance of it this way. It's an otherwise so-so photo, the panning isn't great and the car isn't sharp (due to the enlarging), but developing it like this made it a lot more memorable to me. The car was a then-new Porsche 996 911 GT3 MK2 (similar to the one I drove last year), which was quite a treat to see back in 2004, as it was the first GT3 to be imported to the US. Be sure to click the full-resolution shot to see the grain and details. Edit: Just for fun, I've added photo I took of a GT3RS yesterday from the same vantage point.